Objectives: Explain and illustrate the concepts of halāl and harām. Halāl: is any action or thing which is permitted and lawful. Harām: is any act or thing which is forbidden. “And the food [slaughtered meat] of the People of the Book (the Jews and Christians) is permitted for you.” (5:7) The slaughtered meat of the Jews and Christians is permitted – one is not required should not seek from them as to whether they mentioned Allah’s name when slaughtering. In Islam, food is seen as a gift from Allah and a blessing – it is Allah who created it for humans to use for themselves. People should thank Allah for the food and drink He has given them. The Prophet (ﷺ) would end each meal with the words: “All praise is for Him who has given us food and drink…” Muslims are expected to show their respect for Allah’s bounties by not wasting food, and by not being greedy or eating more than what is good for them. The significance of Halāl (Lawful) and Harām (Unlawful): The Qur’an and Sunnah forbid several foods and makes them harām such as: pork, blood, wine (intoxicants), the domestic donkey, and animals not slaughtered in the name of Allah. Islam forbids the eating of insects (except the locust), and animals with fangs and talons are also forbidden, as is the frog. The Messenger of Allah(ﷺ) prohibited the eating of every beast of prey with fangs, and every bird with a talon (Abu Dāwood, 3803). Consuming that which is harām knowingly is sinful, and is a cause of earning the anger of Allah, and the supplications not being answered. 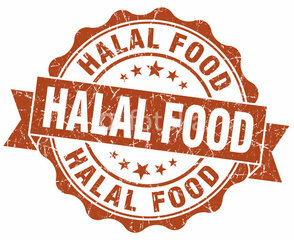 Buying halāl food: Many shops have approval from “Halāl Food” authorities so that shoppers can buy with confidence. They can also look at the ingredient list for everything they purchase to make sure that pork, blood, intoxicants, etc. can be avoided. Some ingredients are hidden behind numbers, so Muslims can check online to see what they contain. There are many restaurants that now serve halāl food such as Subways, Nando’s, etc. Furthermore, there are many Muslims who regard the slaughtered meat of the Jews and Christians to be halāl – and this is based upon the statement of Allah above (Qur’an 5:7); and likewise from the statements of Messenger; and his Companions, who declared the meat of the People of the Book to be permissible (except for pork of course). So these Muslims will buy chicken, beef, lamb, mutton, etc. from the major supermarkets based upon these texts and the fatwas of numerous Scholars. Recognising halāl food: Many Muslims in this country are from India, Pakistan and Bangladesh. They have their own traditional food but other non-traditional food is also halāl. Fish and chips are halāl as long as they were not fried in pork fat! So its not always easy to spot what is haram, but by simply adhering to the general principle with respect to food and drink, “everything is permitted unless there is evidence for its forbiddance,” a Muslim is relatively safe. Many scholars state a further principle that a Muslim does not overburden himself with detailed investigation before eating food presented to him. If he/she has done the basics in terms of ascertaining the ingredients, then that should suffice. Some foods contain “gelatin” and it is not obvious at first glance as to whether it is halāl or harām. It is often used to set fillings and jellies. “Pork gelatin” is made from boiled bones and skin of pigs, and is therefore harām. Other types of gelatin are halāl because they do not contain pork. So one needs to pay attention to the clear and obvious ingredients. What is the Islamic position on the meat of the Jews and Christians? What is the Islamic ruling on sea creatures?